Black Label Society and former Ozzy Osbourne guitarist Zakk Wylde and his wife, Barbaranne, welcomed a new addition to the family this week. Sabbath weighed in at eight pounds, 1.3 ounces and measured 21 inches long. 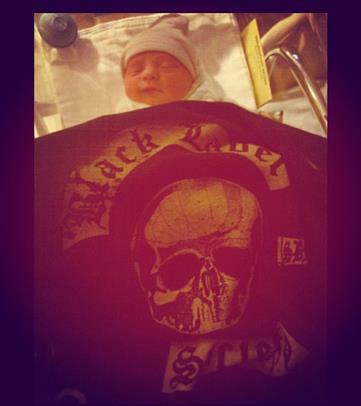 The couple’s fourth child, Sabbath is named after the legendary metal pioneers Black Sabbath. Zakk reunited with Osbourne on the recent Ozzy & Friends tour, which was put together after the original Sabbath reunion trip fell apart following guitarist Tony Iommi’s cancer diagnosis earlier this year. Last week, Black Label Society announced that the band will be appearing at the Sunset Strip Music Festival honoring The Doors next month; they’ll also play a full Canadian tour this fall.